The global vision giants Bausch and Lomb are constantly working to find ways to optimize their customers' eye health. One of the best ways that they have discovered is to provide vital ocular nutrients which maintain vision, and of these, one of the most effective is Ocuvite Lutein. Lutein is a protein which occurs naturally in the body and maintains the macula - a part of the eye which can degenerate with age, drastically limiting vision. So maintaining a good supply is essential. • Ocuvite Lutein supplies one of the most important ocular nutrients (Lutein) without the need to fuss about your intake of green vegetables. This can be particularly convenient for those trapped at work, or who regularly travel. 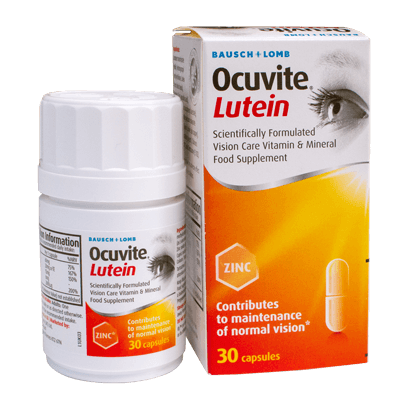 • The Ocuvite Lutein pill also contains essential vitamins, A, C and E as well as Copper and Zinc - all beneficial for the eyes. • Comes in pots of 30 pills, to be taken once or twice per day. • Regularly taking Lutein can prevent or slow the development of macular degeneration, one of the world's most common eye disorders. Nutrition, as everyone knows, is important. However, we don't always eat what we should. With this in mind, products like Ocuvite Lutein are a godsend. Just take a pill a day and you will receive your recommended daily intake of vision preserving nutrients.